Each colored circle represents a different Workspace. You can quickly switch from one workspace to another by clicking different icons. The circle icon with the white outline is your current Workspace. All workspaces across every Organization you are a part of will be in this sidebar. Click the grey "⨁" on the bottom of the list to add a new Workspace. Look here first when you need help with anything at all. 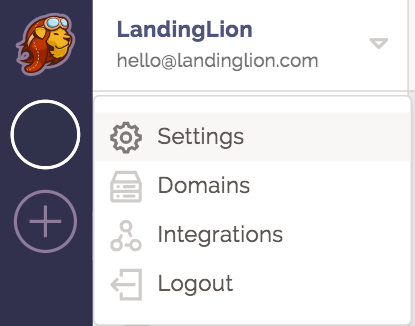 You can open up a live chat with a Landing Lion team member. The Navigation Pane is the easiest and fastest way to access your Workspace's core features: Collections, Visitors, Templates, and Files. Collections - Create collections, build and publish landing pages, and design Split Tests to experiment with new ideas. Visitors - Filter, sort, and export the visitors your landing pages have generated. Templates - You can also build your own custom templates in this view. 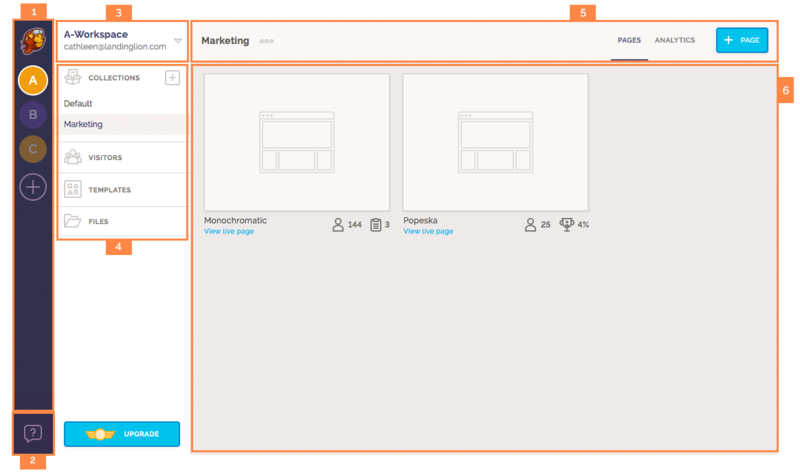 Files - Upload and organize the assets you'll be using to compose your landing pages, from images to downloadable PDFs. UPGRADE button - Click this button to upgrade to a plan that better suits your growing needs. Pages - View the pages you've created in this Collection. Analytics - View how your pages are performing, where your traffic is coming from, and where your visitors are in the world. + PAGE button - Click this button to create a new page starting from a template. The largest and most important area in the interface. Depending on your selection in the Navigation Pane, you'll view your pages, visitors, templates, reports, or files in this pane.